Having one elite player on the floor is a seismic advantage when each team can only play five at one time. However, if a pair of superstars share the floor — Shaq and Kobe; Michael and Scottie; Kareem and Oscar — that team’s likelihood of winning the NBA championship skyrockets. And in the instances where teams have had three All-Stars, we’ve seen some of the greatest basketball teams ever assembled. Matt Zemek and I continue our run of ranking the NBA’s best with a look at the greatest trios of all time. (Important disclaimer: I do not have Russell/Havlicek/Jones or Jordan/Pippen/Rodman on my Top 5. Why? In the case of the Bulls, Dennis Rodman was not an All-Star in any of his three seasons with the Bulls. Yes, he did lead the NBA in rebounding, but Rodman was comparatively one-dimensional next to the greatest duo in NBA history. In their first season together, the Ubuntu Celtics outscored opponents by 10.3 points per game, the best rate of the new century. Yes, Garnett/Pierce/Allen only won one title together, but that in itself was a total fluke: they lost a toss-up 2010 Finals against the Lakers; Garnett’s injury in 2009 derailed a probable repeat; and the Big 3 in Miami prematurely shut their title window. Garnett won Defensive Player of the Year; Allen had one of the greatest 3-point shooting seasons ever (2.5 for 6.2, 39.8 percent); and Pierce consciously shaved per-game figures for one of his most efficient seasons. The trio fit so well together that they instantly elevated the play of youngsters Rajon Rondo and Kendrick Perkins. Their selflessness — all three were 30-somethings chasing their first title — created one of the defining teams in NBA history. Fact: Miami (2011-2015) is one of four NBA franchises to make four straight Finals appearances. 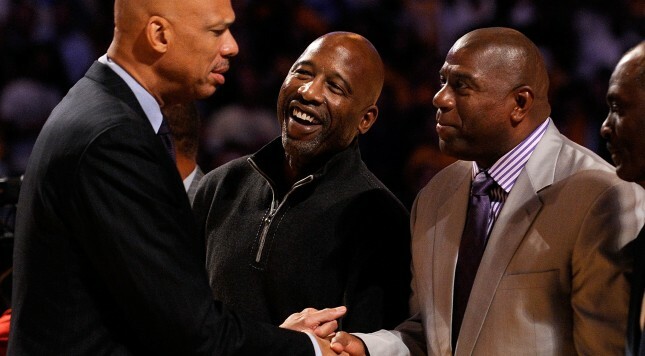 Fact: Magic and Kareem made three straight Finals between 1982 and 1984 — without James Worthy being quite the player he became in 1985, when the improved and deeper Lakers promptly won the title. Fact: Both Miami and L.A. won two out of four titles during their runs. So did Boston’s trio from 1984-1987 (two titles). Even more than “early-period Cleveland LeBron,” Miami LeBron James is one of the greatest players in NBA history. Dwyane Wade and Chris Bosh were perennial All-Stars in the primes of their careers. This group should probably be ranked higher. As LeBron makes it five years in a row (and counting) of personally making the Finals, perhaps we’re already underrating what the Miami Big 3 did. The case for Boston over L.A. is solid: Their trio was the driving force behind one of the greatest teams in NBA history. Bird’s prime is one of the Top 6 we’ve ever seen, Parish is criminally underrated (he won a championship with the 1997 Bulls at age 43!!!) and McHale is arguably the greatest sixth man in history. Kareem/Magic/Worthy won three titles in four years (1985-1988). While McHale was a member on all three 1980s Boston title teams, he was a rookie in 1981 averaging just 10 points per game. Yes, I’m splitting hairs. The Lakers’ trio created one of the memorable playing styles in basketball history. The Celtics, meanwhile, were the Lakers’ lone rival in terms of passing the rock, and Boston possessed the league’s greatest frontcourt. But the rules force me to pick, and I’ll give the slightest of nods to the Lakers, who, of course, won five titles in the 1980s to the Celtics’ three. To convince you that Duncan/Parker/Ginobili is the greatest trio in NBA history is really about convincing you Manu Ginobili belongs on this list. After all, Tim Duncan is as big a name as any on this post, and Tony Parker is a Finals MVP who probably deserves more credit as an all time great lead guard. Let’s start way back in 2004, when George W. Bush was wrapping his first term as President, and Ginobili saw his playing time shoot up in his second season in San Antonio. He averaged 12.8 points, 4.5 rebounds, 3.8 assists and 1.8 steals in 29.4 minutes. Ginobili started about half of the teams games as Gregg Popovich experimented with the Argentinian in the sixth man role he’d come to master. That summer Ginobili led the Argentinian national team to a Gold Medal at the Olympics in Athens. The highlight of the tournament was his game-winning buzzer beater with 0.7 seconds remaining, on the opening day of the Olympics, in a game versus Serbia and Montenegro, and Ginobili led the team in both scoring and assists. Flash-forward to 2011. Barack Obama is the first black President. Ginobili has averaged at least 15 points, 3.5 rebounds and assists, and 1.5 steals over each of the past seven seasons. He maintained his career shooting averages (.450, .368, .827) and helped lead the Spurs to two more championships. Three years later, Ginobili celebrated his 11th year as a rotation player in San Antonio by averaging 14.3 points and stroking 39 percent of his 3s in the playoffs. He was as critical a cog as ever on a fifth Spurs title team (his fourth ring). Ginobili was a step behind in 2014-’15, and while the Spurs enter 2015-’16 as a title favorite, that has more to do with a different San Antonio trio (LaMarcus Aldridge, Kawhi Leonard and Danny Green). Yet, Popovich and Duncan’s quest for a sixth ring will inevitably call upon Ginobili somewhere along the way — a big shot in round one; a stretch of 15-20 games when a starter goes down with an injury; or a 3-pointer in the corner with the Finals on the line. He’ll be ready, because the Spurs are always ready, and this trio’s impossible longevity and reliability are what define them. The co-authors of four titles, the Spurs’ version of a holy basketball trinity has earned its place on this list. Do keep in mind that when looking at these trios, one should generally try to respect and honor them as they were, and not try to rearrange history. What does that mean? It means that one shouldn’t try to match the most idealized versions of each player with each other. In other words, you can’t match early-1970s Kareem with Magic and Worthy. You can’t pair late-1970s or 1980 Julius Erving with Moses Malone and Andrew Toney. You can’t pair the fresh-legged version of Dwyane Wade, from 2006, with 2012 LeBron and Chris Bosh. If you could mix and match like that, these lists would be somewhat different. In the spirit of taking everything exactly as it comes, these trios should acquire a certain order. The Spurs’ trio comes in fifth – not so much for any deficiencies, but because the four above it achieved more. San Antonio beat a thin Cleveland team and an unimposing New Jersey Nets team in two of its NBA Finals during the previous decade. The 2005 Detroit Pistons were better than the 2007 Cavs and 2003 Nets, but that was not a complete team in the Motor City. It was second best in the NBA that season, but not a team that would rate highly on an all-time scale. The Spurs, therefore, achieved richly, but as is the case in determining all-time hierarchies, other teams rose to a loftier plateau. So it goes. Bill Russell and Sam Jones were separated by only one year in terms of birth, whereas Bob Cousy and John Havlicek, two Celtic greats, bridged the 1950s-1960s teams that dominated the NBA. The 1963 season was Cousy’s last and Havlicek’s first. The two made great sidekicks for Bill Russell during Boston’s glory years. Why, then, is Havlicek paired with Russell and not Cousy? The answer is Sam Jones. He needed a few seasons to find his footing, but beginning in 1962, he became an All-Star-level player and remained a force for the rest of the 1960s, through the 1969 championship season that completed the era. Jones has to be bundled with Havlicek and Russell more than with Cousy, since his best and most prolific years came with Havlicek. Russell, as is well known, didn’t have to score a lot to dominate a game. His prowess on the glass and as an interior defender did so much to help the Celtics in the 1960s. With Havlicek being an expert at finding holes in a defense and Jones filling the role of a trusty perimeter scorer, the Celtics – who were balanced and deep – had their three anchors, the players who beat Jerry West and Elgin Baylor in each and every NBA Finals meeting between the Celtics and Lakers. The great wing defender and secondary scoring option. The great combination rebounder-defender-antagonist who got inside the heads of Karl Malone and countless other opposing power forwards. In the persons of Michael Jordan, Scottie Pippen, and Dennis Rodman, the Chicago Bulls had three defenders whose instincts – and arms – covered so much of the court and anticipated so many of the opponent’s offensive moves. In these three persons, the Bulls found three players who could perform so many tasks at both ends of the floor, Rodman more limited to rebounding at the offensive end. Jordan and Pippen were both so hard to guard that the likes of Steve Kerr and Toni Kukoc were able to get their fair share of shots in meaningful moments… and hit them. The dynamism of the Jordan-Pippen combo therefore enabled Rodman to operate, knowing he didn’t have to be a scoring presence for the Bulls. If he could simply attack the offensive glass with some success, he was doing his job at that end of the floor. Any team should have three players who could fill so many roles. The Celtics – especially in their majestic 1986 season but genuinely in all three of their championship seasons – moved extremely well and worked in concert with each other. The ball didn’t stick or disappear into the low post. If the ball was dumped into the post, McHale and Parish didn’t pound the ball several times the way Charles Barkley would in later years. McHale, when facing up a defender, didn’t hold the ball for several seconds the way Karl Malone later would. The Celtics kept the ball moving. The greatness of Bird, Parish and McHale is found not just in their stats or accomplishments, but in their shared recognition of how the Celtics needed to play. They were all consummate professionals without Dennis Rodman’s sideshows. They brought a little more to the table in their best years, and did what they did in the face of much tougher late-round playoff opposition than what the 1990s Bulls generally faced. They deserve to be slotted second here. We’ve written a lot about Kareem and Magic over the past week and a half, so let’s discuss James Worthy a bit. He’s not one of the 20 best NBA players of all time, but very likely one of the top 50. He possessed a lethal first step, was extremely savvy in making low-post moves, and developed a mid-range jumper which made it necessary for defenses to guard him away from the basket. His offensive game steadily ripened over the course of his career. Yet, Worthy was so much more than a flash-and-dash scorer. He was a capable rebounder and passer, and his long arms made him a formidable defender who – as the above video shows – sold out on defense and poured forth every last ounce of effort on a consistent basis. Kareem was the Lakers’ best player in the 1985 NBA Finals; Magic was that person in 1987; Worthy was that man in 1988, as the Lakers repeated and made history. I’d go to the arena with these three more than any other trio.